Beer brand blocks entrance to beach to raise awareness of issue. 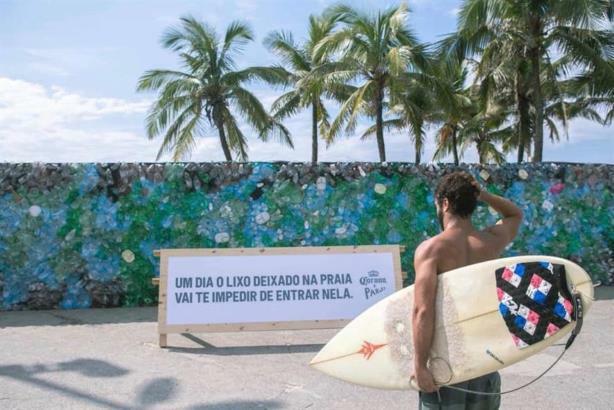 Corona built a huge plastic wall blocking visitors from Brazil's famous Ipanema Beach in a stunt designed to highlight the threat of plastic pollution in the seas. The 15-meter-long, two-meter-high wall blocked the entrance to the Rio de Janeiro beach, with a sign in Portugese translated as, "One day, the trash left on the beach will stop you from getting into it." The wall was built using rubbish collected from the beach over three days. The stunt is part of a partnership between Corona and non-governmental organization Parley for the Oceans. It was designed to raise awareness of the ecological threat to the world's seas from plastic. Last year saw Corona and the charity unveil a plastic "wave of waste" sculpture made from rubbish. It appeared as part of an out-of-home installation at Old Street, London, and featured Australian actor Chris Hemsworth surfing in the billboard image as the plastic wave rolled out into the third dimension. Similar OOH activations have been run in countries including Australia, Colombia, the Dominican Republic, and Peru.